The International Laboratory Freezer Challenge promotes sample accessibility, sample integrity, reduced costs, and energy efficiency by harnessing a spirit of competition within and between laboratories. Challenge participants use well-evidenced criteria and best practices that support science quality and resilience while minimizing total costs and environmental impacts of sample storage. Efficient, effective sample storage for laboratories around the world. The International Laboratory Freezer Challenge utilizes friendly competition to optimize sustainability of freezer management in laboratories. Any type of laboratory is eligible to participate. The Freezer Challenge occurs over a five-month period where individual labs and institutions work at their own pace to implement optimal cold storage management practices. Scorecards are submitted to the Freezer Challenge where laboratory institutions are scored and ranked against peer institutions. Data from the Freezer Challenge will be recorded for future research opportunities. 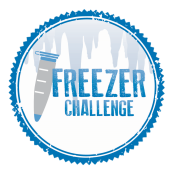 Special thanks to Amanda Le for creating the Freezer Challenge logo!